Thanks for that report, both fights seemed to have their moments, especially the second one. Asiaticus is able to pick up a new skill and wins 11 gold. Senex receives 3 gold. There were mutterings that both gladiators seemed underdone for the fight (rolling low strength), and that Androcles was not happy with this. Quadratus was said to have left his meeting with Androcles in an agitated state. This may be the reason Asiaticus has now been paired with the skilled Bion as his new training partner. Bion is the favourite of Quadratus and always receives special treatment. While Senex is still recovering, there was a particularly brutal training session held where Quadratus (with the large mongrel dog Rufus at his side) was egging on Bion in a mock fight with Asiaticus. Even though blunt weapons are used, Bion inflicts a wound on Asiaticus, much to the joy of Quadratus who clapping with glee exclaims “see, that’s how real gladiators fight! No wrist wounds this time! Ha ha ha ha..” Distracted, Bion looks at Quadratus, laughing as well. Asiaticus sees an opportunity, he can either (1) lunge forward and strike at the distracted Bion, causing a wound, (2) hurl his wooden sword at Quadratus, or (3) just stand up and resume training. OK, a hard set of choices. My conception of Asiaticus is that he is an older man, possible aged around 30, so a long time survivor, not only in the arena but in the "politics" of the school. This could argue for a cautious response to Quadratus' bullying, but on the other hand Asiaticus would be totally aware that to let this incident pass would give Quadratus and Bion the go-ahead to step up the level of future bullying. So, after all that ... Asiaticus takes a shot at Bion and causes a wound. Asiaticus, sensing the opportunity leapt forward at Bion, who surprisingly reacted quite fast so that the sword of Asiaticus only grazed his flank* as he flew past. 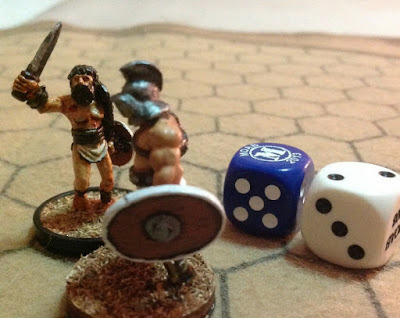 Spinning around, Bion was ready to club his sword into the back of Asiaticus, but was stopped as a loud voice was heard. Androcles was standing on the balcony overlooking the training grounds. “Stop this at once!” he yelled. “What are we running here Quadratus? 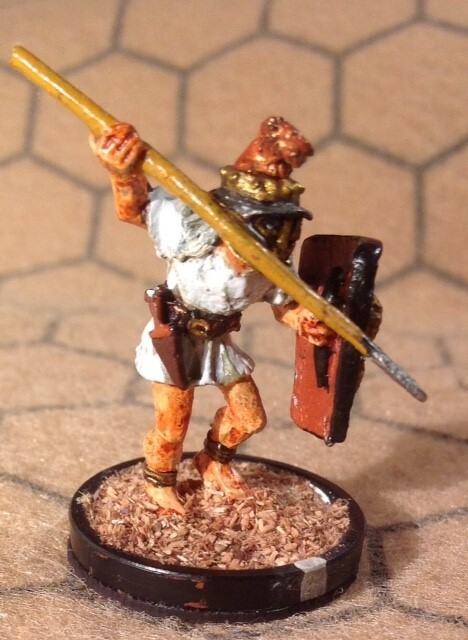 A school for gladiators or a school for praegenarii? Everyone dismissed!” At this, all gladiators returned to their rooms as Androcles and Quadratus spoke. Bion cast some menacing looks at Asiaticus as they left. For a couple of days after the incident, Quadratus placed Asiaticus on half rations, giving the extra food to rufus. As the weeks passed, Senex eventually returned to training, fully recovered. The depressing mood in the ludus was lifted by the news of some games coming up. It seems the populace needs some distraction as there was general unrest in the province. Quadratus didn’t make any disparaging comments this time as he was quite pleased that Bion had been chosen for the final fight in the games. “If Bion wins” he proudly announced, “he will be able to challenge for the Primus Palus!”. In addition to your gladiators fights, you have the chance to bet on Bion’s fight, the odds are: if he wins, you get back double (so if you bet 1 gold, you get back two gold), if he loses, you get back triple (get back 3 gold for 1 gold bet). Let me know if either gladiator wants to bet on Bion winning or losing as well. * I rolled a 1 for the attack …. Hmm, I see a showdown coming in the future if Asiaticus and Bion both continue to survive. I will give Asiaticus the defensive "Dodge" skill, this seems to suit his character better, as a cautious unspectacular survivor-type. Asiaticus will also bet 4 of his accumulated gold, on Bion losing. There won't be any further complaints from Androcles about underdone gladiators, as Senex scored a '6' and Titan scored '1' on their strength rolls! Just why Titan was presented in the arena with such poor preparation is a mystery. Perhaps his trainer thought his sheer size and aggression (with the "Attack" skill) would be enough. It was all over in a flash, even before the crowd had finished buying peanuts (or possibly turnips) from the vendors moving along the rows. Senex and Titan closed, jockeying for position a little. Senex was able to take advantage of two successive poor AP dice by Titan to launch an attack on his unshielded flank. The dice roll was a double 6 special event and Titan suffered 8 wounds killing him outright. Senex (L) hits Titan (R) with a killer blow, at the first exchange of the fight. There was a stunned silence from the crowd when they realised what had happened, then growing applause. 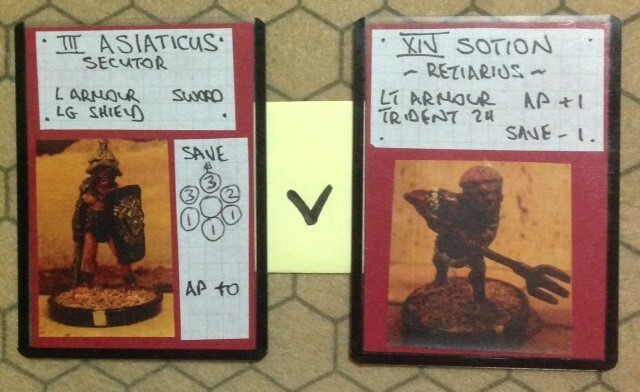 You have to hand it to Quadratus, he knows how to prepare a fighter for the arena when he is motivated! This time Asiaticus scored '4' on his Strength dice. So both Androcles fighters with above average Strength today. 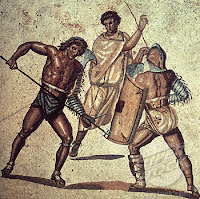 Sotion is a Retiarius with an unusual fighting style. He does not carry a net, so he can use the 'armour penetration' capability of the trident, used two-handed. He is a dangerous opponent, with the 'Reflexes' and 'Stamina' skills. Because of this latter skill his final Strength score was '10' (v '8' for Asiaticus). The two fighters didn't waste any time, and it was Asiaticus who did the initial attacking, but to no effect. Then Sotion pulled one of his trademark moves: scoring 6AP he stepped back from Asiaticus and attacked two-handed with his trident. 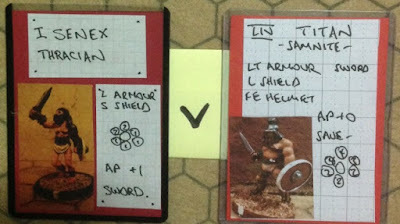 Asiaticus failed to save and took 4 wounds taking him to "wounded" status (the armour penetration effect was cancelled by his Dodge skill). Asiaticus fought on, doggedly continuing to take the fight to Sotion but succeeding only in building up his fatigue. Sotion struck again, taking Asiaticus down to only one Strength, with three fatigues. It seemed to be all over, punters in the crowd even started settling their bets. But it wasn't over at all. Sotion may have been under orders from a match-fixer who has wagered on the final blow being struck from behind, or something, who can say for sure. All we know is, he stepped back from Asiaticus and began to circle around him, as if to get into his rear. *** Asiaticus stayed still, shedding fatigues, most likely awaiting the final blow and too weak to resist. Then, in a twinkling, a poor AP roll for Sotion was followed by a good roll for the no-longer-fatigued Asiaticus. Now it was Sotion being attacked from a flank, and taking 6 wounds. He retaliated with another trident thrust, but this time Asiaticus parried it. Fights broke out in the crowd as those who had paid out their losses on Asiaticus wanted their money back! He followed up Sotion and inflicted another 2 wounds. Remaining Strength at this point was Asiaticus 1, Sotion 2 and 1 fatigue. Initiative passed back to Sotion, but his flurry of attacks no longer had the same results, and his fatigues now exceeded his Strength. Asiaticus took Sotion down to only one Strength with a shield-bash. Sotion hit back with a serious trident thrust but Asiaticus parried, then another which hit, taking Asiaticus to 0 Strength. Asiaticus fell, but the crowd demanded he be spared after such a thrilling comeback. Sotion was the winner, but is badly wounded and exhausted, so hardly able to savour the moment. Both had to be carried out of the arena on stretchers. *** This was a bit of a fiddle of course, to save Asiaticus, but I don't think it was totally unreasonable. I diced to see if it could happen, allowing it only if a 1 or 2 was rolled. The result was a 2. I wonder what Quadratus will have to say about todays action?